Alan Scott’s Ovencrafters provides DIY masonry oven plans and hardware (doors and pyrometers) for bakers wanting to start their own small business, or just to bake large amounts of bread and other food for family and friends. It was set up on Gandhian principles of â€œPolicy with principles, commerce with morality, wealth through work, and science with humanity.” Many ovens and many small bakeries now feed good bread to their communities as a direct result, and the book Alan inspired and co-wrote, The Bread Builders, has become a bible for a growing circle of builder/bakers. “Ovencrafters began as a request, from Laurel Robertson who is a friend and also the author of the Laurelâ€™s Kitchen Bread Book. She asked me to build a brick oven for her kitchen. When her first loaves emerged from that oven I knew that something lost was miraculously being rebirthed. Since this beginning in 1982 many other long lost aspects of bread baking, milling and growing grains have been rediscovered; even wood heat has revealed itself to be the only ecologically sound, sustainable and non polluting source of energy for small scale bakeries. However it is largely the inimitable deep penetrating heat of this new generation of masonry ovens that has triggered much of this work. Ovencrafters oven designs have been developed in the field over the last 25 years culminating in a type of oven that never existed before this. These ovens constitute a radical departure in building technique and use that has made it possible for the first time for small rural based home and village bakeries to be viable and competitive with the industry at any level. With the ongoing loss of middle class occupations throughout western societies, many with even moderate skills and capital can create an invaluable small business in their communities that will find ready support from them in return. Many are finding for the first time the joy of meaningful work in the bosom of their communities and free from the distant hidden grip of the corporate world at last. Alan’s daughter Lila continues the business, along with her main profession sewing in the maritime industry. Her brother Nick builds ovens, and they are still connected to many of the builders that Alan trained. When we were first getting to know each other, my wife Hannah and I spent several wonderful days visiting and baking with Alan, who lived in an old farmhouse on the northern CA coast where there was always a hot oven and, apparently, a steady stream of bakers, builders, and curious visitors. We fit in the latter category, as we were on our way to a wedding in SF. But for a few lovely days, we camped on Alan’s floor, and managed to get in on a brick oven build, a commercial batch of pita and bread made by a young woman who was using Alan’s oven to run what was essentially a community-sponsored-bakery, as well as working in the garden, and much conversation and many walks through the beautiful hills around his house. It was, essentially, the start of our marriage, as well as a long and nourishing relationship with Alan, who was always generous with advice, assistance, and support. 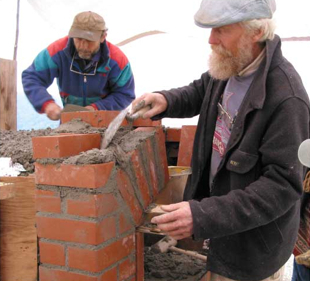 When I finally re-wrote my little book about how to make a mud oven, Alan agreed to write the forward. By then, he had moved back to his native Australia, and our contact was limited to email and phone. He died in 2009, at the age of 72, in Tasmania. We miss him. Hi, just found this site while trying to find some type of book dealing with Masonry Wood Stove plans. The wife and I would like to build a cottage and if we are going to build it, we’d like to have a good design including a Masonry Wood Stove capable of heating the cottage and with luck also providing an oven for baking. The concept sounds simple but finding any written material on how to do it or designs is a bit of a challenge. Can you lend some assistance / provide some direction? Take a look at our archive Home Heat for some ideas. Also, the Cabin Stove is an evolving design that is getting good feedback on its initial prototype. Please also leave links to other information you find. Ovencrafters has disappeared. Any news on them?